It's a pretty safe bet that you're already familiar with Snyder's of Hanover. The world famous pretzel company has been making classic sourdough treats since 1909. Today, Snyder's is part of the Snyder-Lance corporation that features familiar brands like Jay's, Tom's and Krunchers. Snyder's has put a new spin on their traditional, "Old Tyme" pretzels with their Pretzel Pieces snacks. These crunchy pretzels come in a variety of flavors ranging from the tame to the exotic. One flavor that caught my eye was Hot Buffalo Wing. I'm always curious about chips and snacks that attempt to incorporate flavors like Buffalo or BBQ. It's a risky proposition that doesn't always come together well. The crunchy sour dough pretzel pieces are seasoned with dried cayenne pepper sauce. Snyder's doesn't hold back on the seasoning. Each bite is loaded with the orange powder. 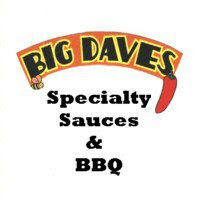 The "Buffalo" flavor is very bold with a strong vinegar tang. The heat level, however, is pretty mild. Calling these pretzels "Hot" Buffalo Wing is a bit misleading. I really couldn't detect much heat at all. While I found the flavor of these pretzels to be satisfying, I was disappointed with the ingredient list. It read like the glossary of a chemistry text book. I'm not a certified nutritionist (or a bio-chemist), but the ingredients lead me to believe that these may not be the most wholesome snack option. However, if you're craving a crunchy, tangy snack, you could do a lot worse. Learn more about these pretzels on Snyder's website. See how the Hot Buffalo Wing Pieces rate on our "Product Reviews" page. 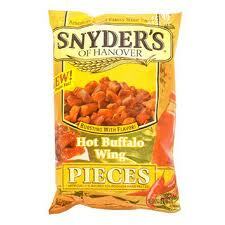 0 Response to "Snyder's of Hanover Hot Buffalo Wing Pretzel Pieces"